Bali Sea Turtle Society is a non-profit organization in Bali that helps in re-releasing the turtle hatchlings into the ocean from the Kuta beach. Found with the ideology to protect the Oliver Ridley turtles, the conservation group also offers opportunities for you to volunteer. Learn the wonderful concept that will change your view on the environment, understand the history of Bali Sea Turtle Society better from the descriptive sign boards, get in line to collect your baby turtle in a small plastic water bath, and scream with joy as you release them into the ocean. Bali Sea Turtle Society is a great place to go with your family and kids. The tokens to release the turtles cost extra. Bali Sea Turtle society may be closed depending on the season. So call the management before visiting. Rent a car or hire a taxi. How popular is Bali Sea Turtle Society? 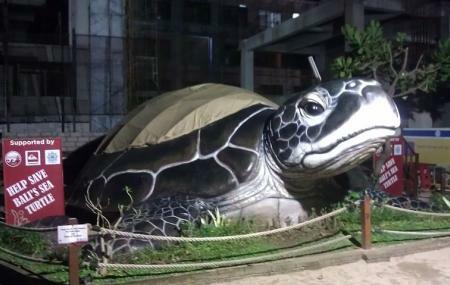 People normally also visit Legian Beach while planning their trip to Bali Sea Turtle Society. They do excellent work for the turtles, and explain everything clearly. Staff are helpful and the turtles are gorgeous!! Visited the place just after 16.00 yesterday and the day before, stayed for like 20 minutes but it remained closed. Was looking forward seeing the sea turtles, the progress they are making and even adopt a turtle. Just walk past and in to take a few photos, the turtles are now hiding inside the big plastic one under the canvas. In the afternoon someone will get on the loudspeaker and announce that they are releasing some of the baby turtles back in the water. You can pay to do this and stand around and wait for your turtle then walk down to the beach line up and wait for the guy on the megaphone to give you the go ahead. This is a slow process I think I waited over an hour one evening just to take photos. I am amazed that no one stands on them because the current pushes them back sometimes, but they are strong swimmers and eventually find their way back to sea. A great opportunity to see Indonesia try to redeem itself and take some photos while you are there. These people are doing their best to look after the turtles of Kuta beach. Make sure you arrive early to collect your token and if it is a hot day be prepared to wait until it gets cooler before you can release your turtle. You all line up with your turtle in a tub and let him/her scuttle towards the ocean. You then scoop them back in to the tub and walk them out in to the sea before saying goodbye and releasing them in to the waves. Great experience.